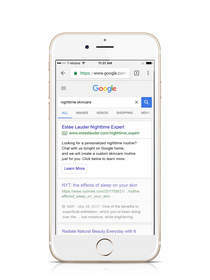 NEW YORK, NY--(Marketwired - Nov 16, 2017) - Estée Lauder, a global leader in prestige beauty, announces today its collaboration with Google to offer consumers unique, in-home beauty experiences for the Google Assistant on Google Home. This is the first collaboration of its kind for the Estée Lauder brand, offering personalized skincare solutions and beauty techniques through voice-activation across Google. The first initiative is the "Estée Lauder Nighttime Expert" app. Future experiences will be available through the Google Assistant on mobile, in ad units on the Google Display Network and on esteelauder.com. Supporting Media will include YouTube, Programmatic and Search. "We are thrilled to collaborate with Google to be at the forefront of creating personalized consumer beauty experiences via the emerging world of voice activation," said Stephane de La Faverie, Global Brand President, Estée Lauder. "Combining our beauty expertise with Google's technology allows us to build on our digital evolution and offer the latest innovation to further enhance our consumer experience." 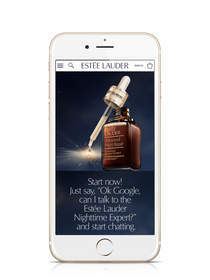 Launching first this December, the brand will roll out the "Estée Lauder Nighttime Expert" app, accessible via the Google Assistant on Google Home. To try it out, users can say "Ok Google, can I talk to the Estée Lauder Nighttime Expert" to their Assistant on Google Home. The chat experience will offer consumers personalized nighttime skincare routines through a series of questions and answers. The personalized recommendation will be enhanced by asking users if they would like to learn skincare application techniques. Once complete, the "Estée Lauder Nighttime Expert" will refer users to a free service featuring the brand's hero serum, Advanced Night Repair Synchronized Recovery Complex II, at an Estée Lauder counter. "Adding voice experiences will unlock the next level of personalization and help us reach a new generation of consumers," said Tricia Nichols, Vice President, Global Consumer Engagement, Estée Lauder. "Through our collaboration with Google, we are expanding our Omnichannel efforts to go beyond stores and online to in-home, at the moment." The "Estée Lauder Nighttime Expert" will be available for the Google Assistant on Google Home this December, just in time for new device purchases this season. Estée Lauder plans to launch new activations beyond the Estée Lauder Nighttime Expert globally in early 2018. Estée Lauder is the flagship brand of The Estée Lauder Companies Inc. Founded by Estée Lauder, one of the world's first female entrepreneurs, the brand today continues her legacy of creating the most innovative, sophisticated, high-performance skincare and makeup products and iconic fragrances -- all infused with a deep understanding of women's needs and desires. Today, Estée Lauder engages with women in over 150 countries around the world and at dozens of touch points -- from in-store to digital. And each of these relationships consistently reflects Estée's powerful and authentic woman-to-woman point of view.